Some teachers require an annotated bibliography before students write a paper, design a project, or prepare a presentation. Why? Because students who spend quality time preparing an annotated bibliography develop a deeper understanding of their topics, thereby writing more effective and engaging papers. How does an annotated bibliography help? It helps you organize sources in a practical, logical format. It forces you to read sources critically and evaluate their usefulness. In fact, you cannot write annotations without first developing a thorough understanding of your topic. You will also be able to determine whether you need to refine your research question and/or gather further sources. It helps your teachers provide further guidance by showing them how well you understand your topic. How do I prepare an annotation for a source? Read the source material (article, essay, etc.) carefully. Highlight key points/ideas and take notes in the margin. If you cannot write directly on the source, use index cards or Post-It notes. The goal is to gain a thorough understanding of the source. In about 3-4 sentences, summarize the key ideas in the article. In 2-3 sentences, evaluate the usefulness of the information. Click to see sample annotated bibliography, courtesy of Diana Hacker via Bedford St. Martins. Click to see sample annotated bibliography, courtesy of Diana Hacker via. Bedford St. Martins. 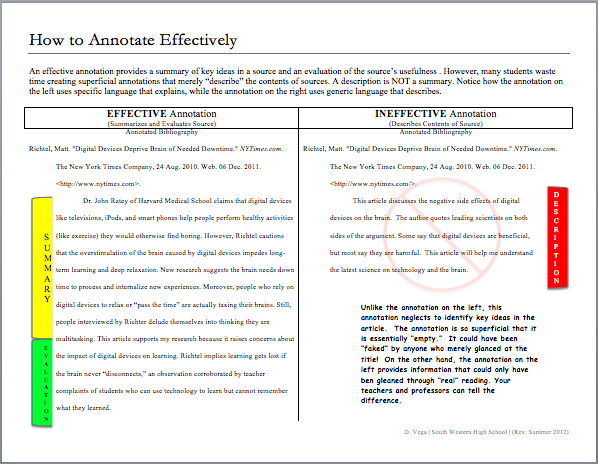 Click to access annotation guide.